Nomos Glashutte’s Club Campus line speaks for itself, an accessible watch aimed at recent graduates. It’s pretty niche market for potential watch lovers, but it’s a nice thought – and a very nice graduation present. 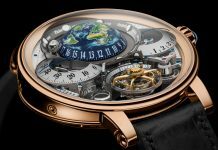 Now it’s gotten a lot nicer with the introduction of three new pieces and the German watchmaker’s first steel bracelets. The Club Campus Neomatik, Neomatik 39 and Midnight Blue all share similar characteristics. First, they all have California dials, an odd design notion for a Bauhaus-inspired watch brand but one we can’t help but love. Secondly, all three come with Nomos’ in-house DUW 3001 automatic movement. The DUW 3001 movement isn’t new for Nomos, but it is one of their higher end calibres, putting the new Club Campus pieces into a higher price bracket but it’s worth the additional investment. The movement is thin, sturdy and, even though the casebacks are closed (for congratulatory engravings) you can be sure it’s handsome too, with Glashutte stripes and signature three-quarter plate. The only real differences between the three pieces are size and colour. First, there’s the classically-sized 37mm with a white dial, silver-plated numerals and peach-coloured hands. Then you have the 39mm, again with a white dial but this time with blue numerals. Finally, you have the 39mm in midnight blue, again with those bright, luminescent hands. It’s a small selection with a few choice differences but that’s all you really need. The biggest difference however, between these and the rest of Nomos collection, is that these are their first watches with bracelets. Well, two of them are at least. Both white-dialled models come on the first ever metal bracelet Nomos has produced, and it’s a lovely one. Thin, elegant and tactile, they wear as nicely as any strap can; better than many, in fact. 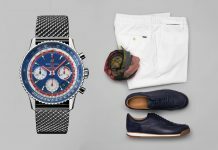 It’s a small chance – and one that’s long overdue – but works perfectly on the equally slim Club Campus timepieces. Case: Galvanized, white silver-plated Arabic and Roman numerals and indexes with silver superluminova (Nomos sheetClub Campus neomatik) or dark blue superluminova (Club Campus neomatik 39), midnight blue Arabic and Roman numerals and indexes with light blue super luminova (Club Campus neomatik 39 midnight blue). 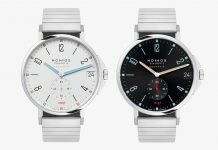 Share the post "NOMOS Debuts New Campus Collection for 2019"